Attention fishermen and boating enthusiasts! 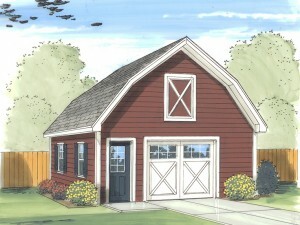 The Garage Plan Shop has the perfect detached garage plan for your boat! Take a look at this drive-thru garage designed to eliminate the hassle of backing your boat and trailer in and out of the garage. Thoughtfully planned with front and rear overhead doors, this boat storage design simply allows you to pull your truck straight thru the garage and unhitch the boat trailer leaving it neatly parked inside. You’ll have peace of mind knowing there won’t be any more hassles with backing the trailer in and out of the garage, and your boat will be protected from Mother Nature’s furry when you’re not on the water. Pay close attention to the floor plan. It even offers enough room on the sides for storage of all the things you’ll need on the water like lifejackets, water skis, fishing poles and tackle boxes. Delivering 669 square feet of usable space, this boat storage garage with gambrel roof is an instant winner! For more boat storage garage plans and drive-thru designs, be sure browse our versatile collections.